Here it the short version, as short as I could make it, which is not terribly short, of our housing situation since arriving in Seattle. First, primo, we lived in a long term hotel. It was only two months old when we arrived, got a great deal because our cable didn't work, and had our car broken into. In fact three cars had their windows broken during our stay. "Hello? Hotel manager? I think you have a problem". Honestly, I think security cameras in the parking lot would be a really good idea. The hotel was actually sorta nice. It wasn't the Marriot, but it had a little galley, and I could stand up straight while cooking. I know, nice, right? After about three weeks, we moved into our friends house while they were out of town for about two weeks. I could stand up straight in their galley, they had a toaster, and an electric kettle, the height of luxury. And I must admit, it was nice having different rooms for different functions, and more than one bathroom. We were spoiled. Then, finally, we rented a house. Four bedrooms, two full bathrooms (more or less), and a small kitchen. I can stand up in this one too. The best part? If you turn the spigot in the kitchen all the way to the left and up, after about five seconds really hot water comes out. Hot water on demand! I am amazed. However, Kristen is giving me a hard time for chucking our composting out the window, and insists that I put it in this cute little garbage can on our counter, and from there into a not so cute stinky plastic bin outside of the house. There are pros and cons to everything in life. Someone else mows it (landlord provided service). We are not gardeners, but we like the idea of being gardeners, so this is a win-win. We have little, cute shoots of bamboo in the middle of the yard, coming from the neighbor. They are only cute since I don't have to mow them. As an aside, it is amazingly difficult to pull up bamboo by hand. The back yard is fenced, which is absolutely, fantastically great for the dogs. They are, I think, visibly happier here than on the boat. Are we surprised? No we are not. For years poor Biscuit had a little lump of something lumpy over his left eye. It had started to grow and he would occasionally clip it with his rear paw when scratching his ears, so it had to go. 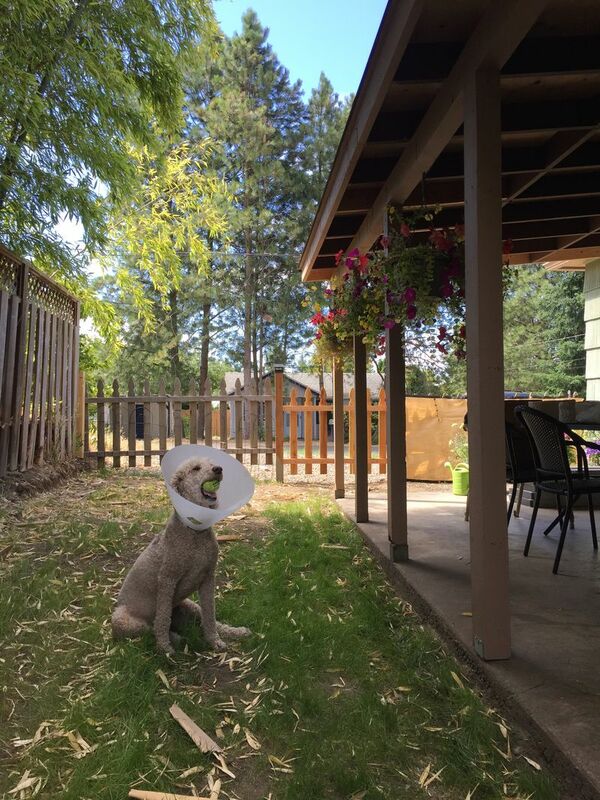 While in recovery with his big, hard, white cone, I decided to play ball with him in the back yard. Prior to renting the house the landlords brought in a backhoe to remove as much of the bamboo as possible, no joke. That left a good chunk of the yard without grass, and while they did plant more, there are several areas of dirt where the new grass did not take. So Kristen planted more grass, and surrounded the patches with those little wire fences, about two feet high. Let's assemble the elements in play. One very excited dog with a hard cone. A somewhat difficult to see little circle of a fence in the middle of the backyard. Dad with a ball in hand, not really thinking about anything in particular. That first throw didn't really go that well. Naturally the ball, to my horror, went bouncing right through the fence, not hitting it at all, with Biscuit bounding behind it like a madman, paws flailing wildly, tounge practically dragging on the ground. To his utter confusion, with his cone acting like a cow catcher on a train engine, Biscuit took out the little fence in it's entirety. He has been a little shy about playing ball with me after that. So we are doing well, adjusting to fenced land life, and buying a lot of used furniture. I do admit is nice not following the weather, worrying about the safety of the boat, or having Biscuit blow his mind every time a dolphin swims by. "Holy crap, there are dolphins right next to the boat, again! Ahhh!!!" But I do miss those dolphins, barking mad dog or no.